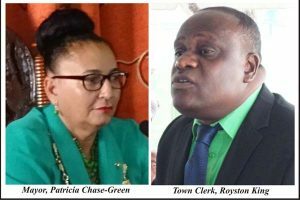 (2) SMART CITY SOLUTIONS INC., being a company registered in Guyana, the registered office of which is at of 62 Hadfield and Cross Streets, Werk-en-Rust, Georgetown, Demerara, Guyana, (“the Concessionaire”). “Booting Fee” means the fee for the removal of a wheel lock which has been affixed to the tire of a motor vehicle or any other immobilization device applied to a motor vehicle in accordance with the Enforcement Actions Escalation Process. Booting Fines may be discounted or escalated according to the terms and conditions described in this Agreement and may be adjusted from time to time as set forth in this Agreement. 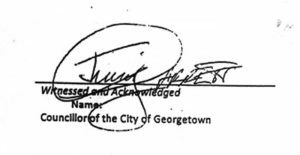 “Concession Agreement” or this “Agreement” means this Georgetown Metered Parking System Concession Agreement. “Consideration” means the periodic fee paid by the Concessionaire to the City for the grant of the right, concession and franchise of the Project. Enforcement Activities” means those activities detailed in Section 4.5. of this Agreement. “Enforcement Actions Escalation Process” means the process detailed in Article 9 of this Agreement. “Exempt Vehicles” means emergency vehicles of the police department, fire department and medical and ambulatory departments of the City. “Garaged Parking Fee” means the fee established according to the terms and conditions of this Agreement as consideration for the privilege of parking a motor vehicle in any Garaged Parking Space. Garaged Parking Fee levels may be adjusted from time to time as set forth within this Agreement. “Garaged Parking Operations” means the establishment, and operation, management and maintenance of the Garaged Parking Spaces within the territory of the City. “Garaged Parking Spaces” means spaces or places within off-street indoor or outdoor parking lots within the territory of the City that are operated by the Concessionaire under the terms and conditions of this Agreement for which the Garaged Parking Fee is applicable for parking a motor vehicle within such parking lots. “Key Platform Features & Operating Standards” means those features and standards detailed in Article 5 of this Agreement. “Metered Parking Fee” means the fee established according to the terms and conditions of this Agreement as consideration for the privilege of parking a motor vehicle in any on-street Metered Parking Space. Metered Parking Fee levels may be adjusted from time to time as set forth within this Agreement. “Metered Parking System” means the technological, operational and logistical platform, equipmen2, supporting structures, computer systems and software used in connection with the administration of Metered Parking Spaces and the Metered Parking Operations, and the collection of Metered Parking Fees there from, and all improvements of any and every kind whatsoever forming a part of and used in connection with the operation and maintenance of the metering system associated with the Metered Parking Spaces. “Other Enforcement Services” means those activities performed by the Concessionaire for the benefit of the City as detailed in Section 4.7. of this Agreement. “Parking Fine” means any fine or citation issued as part of the Enforcement Activities of the Metered Parking Spaces or as part of the Other Enforcement Services activities as penalties upon motor vehicles which do not comply with the relevant parking regulations in effect within the territory of the City from time to time, including any surcharges and any incremental penalties imposed as part of the Enforcement Actions Escalation Process. Parking Fines may be discounted or escalated according to the terms and conditions described in this Agreement and may be adjusted from time to time as set forth within this Agreement. “Parking Fine Issuance” means issuance of any Parking Fine. “Parking Zone” means those certain distinct geographical zones established within the City for the purpose of differential Metered Parking Fees and Parking Fines as described in Article 7 of this Agreement. “Prepaid Card” means a prepaid card platform to be -commercialised and distributed by the Concessionaire across various points of sale within the territory of the City which may be used to pay for Metered Parking Services and other goods and services with such further characteristics as detailed in Section 4.12. of this Agreement. “Reversion Date” means the business day immediately following the date of expiry of the Term, including any extensions of the Term as contemplated in this Agreement. “Storage Fee” means’ the rate charged for the storage of any vehicle per 24-hour period (rounded upwards per 24-hour block) as applied and levied upon motor vehicles towed in accordance with the Enforcement Actions Escalation Process and stored at any storage facility of the Concessionaire until such time as respective motor vehicle owners settle all related outstanding charges and claim and remove their vehicles. Storage Fines may be discounted or escalated according to the terms and conditions described in this Agreement and may be adjusted from time to time as set forth in this Agreement. “Study” means any plan submitted by the’ Concessionaire to the City identifying intended locations and orientation, whether parallel or angled or perpendicular, of Metered Parking Spaces. Concessionaire is adequately performing its obligations under this Agreement and subject to the approval of the City. “Towing Fee” means the fee for towing a motor vehicle in accordance with the Enforcement Actions Escalation Process. Towing Fines may be discounted or escalated according to the terms and conditions described in this Agreement and may be adjusted from time to time as set forth in this Agreement. “Value Added Services” means those services offered by the Concessionaire as detailed in section Article 4.9 of this Agreement. Section 2.2. Number and Gender. In this Agreement words in the singular include the plural and vice versa, and words in one gender include all genders. The division of this Agreement Into articles, sections and other subdivisions are for convenience of reference only and shall not affect the construction or Interpretation of this Agreement. The headings in this Agreement are not intended to be full or precise descriptions of the text to which they refer and shall not be considered part of this Agreement. Section 2.4. References to this Agreement. The words “herein,” “hereby,” “hereof,” “hereto” and “hereunder” and words of similar import refer to this Agreement as a whole and not to any particular portion of it. The words “Article,” “Section,” “paragraph,” “sentence/’ “clause” and “Schedule” mean and refer •to the specified article, section, paragraph, sentence, clause or schedule of or to this Agreement. Section 2.5. Meaning of Including. In this Agreement, the words “include,” “includes” or “including” mean “include without limitation,” “includes without limitation” and “Including without limitation,” respectively, and the words following “include,” “includes” or “including” shall not be considered to set forth an exhaustive list. Section 2.6. Meaning of Discretion. In this Agreement, the word “discretion” with respect to any person or entity means the sole and absolute discretion of such person or entity. Section 2.7. Meaning of Notice. In this Agreement, the word “notice” means “written notice,” unless specified otherwise. Section 2.8. Consents and Approvals. Unless specified otherwise, wherever the provisions of this Agreement require or provide for or permit an approval or consent by, either Party, such approval or consent, and any request therefor, must be in writing (unless waived in writing by the other Party). Unless otherwise defined herein, words or abbreviations that have well-known trade meanings are used herein in accordance with those meanings. Each of the City and the Concessionaire shall be referred to herein as a “Party” and together as the “Parties”. Article 3: Grant of Concession. 41-1) to pay the consideration due and payable to the City according to the terms and conditions of this Agreement, and to retain and enjoy any remaining funds beyond such Consideration which are derived from the Project, for the Concessionaire’s own account to be realised and enjoyed as the Concessionaire’s own profit. Section 4.1. Right of Entry and Access to the Public Way. and all supporting structures and appurtenances thereto, interconnecting the same to any electric utility, telephonic or other communication lines, collecting Metered Parking Operations related revenues, and installing monitoring or observation technology or equipment reasonably necessary for Metered Parking Operations. Section 4.2. Issuance of Parking Fines. herein granted right of the Concessionaire to issue Parking Fines. Upon request of the Concessionaire, _ the City shall provide to the Concessionaire, at the Concessionaire’s sole cost and expense, parking ticket books or r other Items and materials reasonably necessary to enable the Concessionaire to issue Parking Fines. Parking Fines issued by the Concessionaire pursuant to this section shall have the same legal efficacy as if issued by the City. To the extent any part or magnitude of the provisions of this section may ever during the Term come to be considered statutorily or legally insufficient, all remaining provisions and/or otherwise statutorily and/or legally sufficient magnitude of such provisions shall retain legal effect and every reasonable attempt shall be made to attempt by the City and the Concessionaire to restate any such provisions in a manner that both (i) reiterates any such questioned provision in a manner that is In fact legally viable and (ii) retains the nature, spirit and intention of the originally drafted language to the fullest extent possible. Section 4.3. Other Parking Systems and Facilities. (I) are (A) owned or operated by the City; or (B) operated by any individual, corporation, partnership, Joint venture, trust, limited liability company, limited partnership, joint stock company, unincorporated association or other entity; or (c) operated by a Governmental Authority and located on land owned by the City, or leased to the City. (ii) are owned or operated by any third party or entity that is licensed by the City to provide parking or parking-related services. (iv) are used primarily for general public parking. Section 4.4. Reversion of Metered Parking System. Upon expiration of the Term, Including any extensions of the Term which might take effect, and occurrence of the Reversion Date, the Concessionaire shall surrender and deliver to the City all of its rights, title and interest in the Metered Parking System (including all improvements to the Metered Parking System, assets of the Metered Parking System and all tangible and intangible personal property of the Concessionaire (including Inventories) that is included in the Metered Parking System and used in connection with operation of the Metered Parking System, subject, however, as to any intellectual property Included In the Metered Parking System, to any restrictions or prohibitions to disclosure, transfer or sharing thereof and any other rights of third parties with respect thereto. Patrolling the Metered Parking Spaces. Placement of boots or clamps or other immobilization device on the tires of any motor vehicle found to be in violation of parking regulations within the Metered Parking Spaces, subject to the Enforcement Actions Escalation Process. Towing of any motor vehicle found to be in violation of parking regulations within the Metered Parking Spaces, subject to the Enforcement Actions Escalation Process. Receipt and collection of payments for Parking Fines, and any surcharges or penalties assessed thereof, including as set forth according to the Enforcement Actions Escalation Process, relating to parking violations incurred at the Metered Parking Spaces or for Parking Fines related to the Other Enforcement Activities. Payment methods offered for settlement of amounts due as related to any of the Enforcement Activities shall be determined by the Concessionaire and may include any or a combination of the following: by mail, though credit or bank or prepaid card payments, by phone to a call centre, by payments via internet or mobile application, directly at designated parking terminals located on the streets of the City, In designated commercial locations, or any other similarly convenient payment method as may be implemented by the Concessionaire from time to time. Addition of surcharges and increase of amounts due on any Parking Fines related to Metered Parking Spaces, or related to Other Enforcement Services, which have not been paid within prescribed times. Specifically, all parking violations shall be due to be paid within thirty (30) calendar days of imposing of such Parking Fines. Parking Fines may be surcharged at a rate of up to fifty percent (50.0%) if not paid within the Initial thirty (30) day period, and then up to an additional ten percent (10.0%) monthly thereafter until paid. Towing of any vehicle .for which there are existing parking violations that are thirty (30) calendar days or more past due. Covering the expenses of sale. Settlement of all amounts payable by the owner to the Concessionaire, Including for Parking Fines, booting fees, towing fees, storage fees, auction advertisement and processing fees, surcharges and late fees, and any other Enforcement Activities directly related costs. Any positive balance remaining shall be returned to the original owner. shall be authorised to Issue to the purchaser a certificate to that effect and such certificate shall be sufficient authority to the relevant automobile registration and licensing authority to register the vehicle in the name of the purchaser, and any right, title or interest of the former owner in the vehicle shall be extinguished on the issue of such certificate. Towing and storage, services may be sub-contracted by the Concessionaire to third parties. Application of the mix among the various Enforcement Activities .methodologies detailed herein (Parking Fines, surcharging and late fees, booting, towing, storage, auctioning) as well as discounts and waivers to Parking Fines, booting fees, towing fees, storage fees, auction processing fees, surcharges and late fees may be made at the discretion of the Concessionaire, provided that the Concessionaire may render the Enforcement Activities and corresponding amounts payable less severe than as detailed herein, at it own discretion, and provided further that the Concessionaire may not render the Enforcement Activities and corresponding amounts payable any more severe than as detailed herein. The Concessionaire shall reimburse the City with monthly allowances of $50,000.00 per City police and/or other City staff so employed to perform the Enforcement Activities, paid monthly in advance. The City shall assign the Concessionaire’s requested number of police or other City staff to facilitate this manner ‘of Enforcement Activities upon 30 days notice provided by the Concessionaire. Enforcement Activities from time to time. The Concessionaire shall efficiently integrate the Metered Parking Operations with the Concessionaire Enforcement Faculties to the extent reasonably possible. The Concessionaire shall provide direction, counsel and hiring and discharging advice to the City related to all staff so used for Concessionaire Enforcement Faculties. including integration of such staff into the Concessionaire’s operations centre. by the Concessionaire to support the Enforcement Activities so being facilitated by the City. The Parties acknowledge and agree that effective enforcement of parking rules and regulations and punishment of Persons that violate such rules and regulations are material to the Parties and to the administration of this Agreement. To the extent any part or magnitude of the provisions of this section’ may ever come to be considered statutorily or legally insufficient during the Term, all remaining provisions and/or otherwise statutorily and/or legally sufficient magnitude of such provisions shall retain legal effect and every reasonable attempt shall be made to attempt b the City and the Concessionaire to restate an such provisions in a manner that both (i) reiterates any such questioned provision in a manner that is in fact legally viable and (ii) retains the nature, spirit and intention of the originally drafted language to the fullest extent possible. The City shall establish and maintain a system and processes for the adjudication of parking infractions related to the Metered Parking Spaces and to the Other Enforcement Services. Such adjudication system and processes shall grant due priority to the just punishment and resolution of parking violations related to the Metered Parking Spaces and to the Other Enforcement Services. The City shall adequately integrate the information received from the Concessionaire with respect to Parking Fines related to the Metered Parking Spaces and to the Other Enforcement Services into its adjudication system and processes. The City shall take into consideration all reasonable counsel offered by the Concessionaire as to the establishment, maintenance and ongoing operation of its adjudication system and processing of Parking Fines related to the Metered Parking Spaces and to the Other Enforcement Services. The Parties acknowledge and agree that effective adjudication of parking rules and regulations and punishment of Persons that violate such rules and regulations are material to the Parties and to the administration of this Agreement. Section 4.7. Other Enforcement Services. As part of the Project, the Concessionaire shall provide Other Enforcement Services to the City such that the Concessionaire will utilise its Metered Parking Operations and Enforcement Activities to, simultaneously with provision of the Enforcement Activities, provide the service to the City of enforcing those parking regulations of the City which are not directly related to metered parking, including, but not limited to, parking in areas where parking is not allowed, double parking, and other such parking infractions. The Other Enforcement Services shall be performed according to the fines structure and regulations of the City. The Other Enforcement Services shall be subject to the Enforcement Actions Escalation Process as specifically detailed in Article 9 of this Agreement with respect to Other Enforcement Services. (ii) retains the nature, spirit and intention of the originally drafted language to the fullest extent possible. Exempt Vehicles of the police, fire and medical and ambulatory services shall be exempt from paying Metered Parking Fees only during times when such vehicles are parked in Metered Parking Spaces in emergency performance of their police, fire, or medical or ambulatory duties. With respect non-paid parking of Exempt Vehicles, the City will penalise any abuse of such unpaid parking privileges through fines and other appropriate measures and will take all reasonable measures to deter abuse of unpaid parking of Exempt Vehicles in Metered Parking Spaces. Section 4.9. Value Added Services. Any other payment service or marketing and advertising value added service initiatives which may from time to time be Integrated into the Project platform and the Metered Parking System at the discretion of the Concessionaire, provided that any net fees and net commissions generated by such activities shall be factored into the periodic calculation of the Consideration due and payable to the City. The Concessionaire shall not use or permit to be used, any name or mark in connection with the such marketing and Value Added Services that may reasonably be considered to be offensive or otherwise be reasonably likely to result in a negative association by the general public. Section 4.10. Project Names and Logos. pie City grants to the Concessionaire a non-exclusive, non-transferable, royalty free license during the Term to use any names associated with the Project platform together with all existing and future developed logos and marks of the City to be used in connection with the Metered Parking Operations or in connection with the performance by the Concessionaire of its obligations under this Agreement. The Concessionaire, at its own discretion, may elect during the Term to develop, construct, operate and maintain Garaged Parking Operations, whether above ground or subterranean, within one or more locations within the territory of the City, subject to the approval of the City as per the terms and conditions set forth herein. To initiate Garaged Parking Operations, the Concessionaire shall identify to the City available parcels of land, whether above ground or subterranean, within the territory of the City for which the Concessionaire shall provide, for each such location, its development and construction plans, the number of parking spaces to be constructed, the type of parking technology to be employed, and the revenues projected to be therewith generated, and so solicit that the City, at the sole discretion of the City, authorise and contribute for the purpose of the Concessionaire’s developing, construction, operation, and maintenance of each such Garaged Parking Operation, the subject land in exchange for that portion of the consideration which would be paid by the Concessionaire to the City with respect to each and every instance of Garaged Parking Operation so Initiated. As part of the Project, the Concessionaire will have the option of creating and commercialising and distributing across multiple points of sale its Prepaid Card platform which could be used as a method of payment of the Metered Parking Spaces, as well as a method of payment of other products and services available within the City including transportation services such as bus and .metro transportation fees, and other city products and services as may be integrated by the Concessionaire onto the Prepaid Card platform. The City will assist the Concessionaire to integrate the capability of payment of other municipal services with the Prepaid Card of the Concessionaire. The Concessionaire shall be entitled to charge commissions for payments effected through the Prepaid Card. All capital expenditures of the Metered Parking Operations, the Garaged Parking Operations, the Enforcement Activities, the Other Enforcement Services, and the Value Added Services shall be for the account of the Concessionaire, including the establishment of the various elements of the Project and the Key Platform Features and Operating Standards and any Concessionaire Enforcement Faculties which may take effect from time to time during the Term, and all expenditures required to keeping the Platform and the Key Platform Features up to par. All operating expenditures of the Metered Parking Operations, the Garaged Parking Operations, the Enforcement Activities, the Other Enforcement Services, and the Value Added Services shall be for the account of the Concessionaire. The City and the Concessionaire shall convene at least once every 5 years to review and analyze the performance of the Project and to discuss goals and targets for the Project for the respectively successive 5 year period. The first such meeting shall occur no later than the date that is 5 years from the initial commencement of the Term. 20 % of gross Metered Parking Fees actually collected. 20% of gross Parking Fines revenues actually collected. 20% of gross Other Enforcement Services revenues actually collected. 10% of net Value Added Services revenues actually collected. 10% of any gross Garaged Parking Fees actually collected. Any lateness with respect to the Concessionaire’s payment of the Consideration shall cause interest to acrue on any such late Consideration payable at an interest rate equivalent to the Guyana WA Prime Lending Rate as published from time to time by the Bank of Guyana on its Internet webpage or otherwise published or broadcast by the Bank of Guyana. On street multi-space metered parking equipment. Implementation and maintenance of street signs conveniently located and spaced to adequately broadcast applicable parking regulations. Parking equipment which may, at the option and sole discretion of the Concessionaire, have the capability to be configured to accept one single method, or any combination of the following payment methods:. o Coins of local currency. o Bank notes of local currency. o Mobile phone or mobile device application payments. The Concessionaire reserves the right to require that customers electing to pay Metered Parking Fees by method of mobile ‘phones or mobile device applications, purchase credits onto their mobile phones or mobile device Metered Parking Fee payment accounts In minimum increments of $4,000.00. o Payment by phone through an interactive voice response system operated by the Concessionaire. o Payment by phone to a call center operated by the Concessionaire. Communication enabled metered parking equipment. Parking equipment with integrated solar panels and backup batteries. Operation of the Metered Parking System pursuant to applicable laws and regulations of the City. A payment process structure which, at the full discretion of the Concessionaire, may correspond to any of the general ‘pay-by-space’, ‘pay-by-plate’ or ‘pay-and-display’ conventions as are generally known within the metered parking industry, or any combination thereof, and which may further be changed by the Concessionaire at its own discretion, provided that the Concessionaire shall provide one (1) months’ notice to the City and to the public of any such change(s). Consistent and regular provision of the Metered Parking Operations subject to normal course of business interruptions, including, but not limited to, wear and tear, vandalism, accidents, maintenance and improvement activities, and coin collection activities. 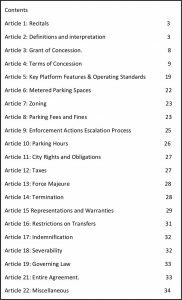 Regular provision by the Concessionaire to the City of Metered Parking Operations performance statistical data, which the City can then use for its own purposes, subject to relevant privacy laws and regulations. Audited financial reports of the Concessionaire provided to the City by the Concessionaire no less frequently than once per year. Public Relations publicity campaign to educate the public in connection with the commercial launch of the Project. Placement of multi-space parking meters at or near the centers of the parking areas covered by such respective multi-space parking meters. Limitation of a ratio of no more than eighteen (18) Metered Parking Spaces to one (1) multi-space parking meter on-City-streets where parallel parking is employed (calculated on the basis of the totality of the Metered Parking Operations). Limitation of a ratio of no more than thirty (30) Metered Parking Spaces to one (1) multi-space parking meter on-City-streets where angled or perpendicular parking is employed (calculated on the basis of the totality of the Metered Parking Operations). Limitation of a ratio of no more than one hundred (100) Metered Parking Spaces to one (1) multi-space metering parking main unit pay station for off-street Metered Parking Spaces, including for any area in which Garaged Parking Operations may be offered. Placement of metered parking equipment by the Concessionaire shall be in convenient locations so as not to unreasonably Inconvenience pedestrian and traffic flows. Repair or replacement of metering parking devices that may malfunction or become damaged during the Term in a timely manner. Vehicles operated by employees of the Concessionaire must be done so by licensed drivers, and with insured vehicles and drivers. Uniformed dress on the torsos of the Concessionaire’s on-street workers to be worn during on-street work. o The license plate number of the violating vehicle. o The vehicle make and model, if listed and available on the vehicle. o The parking regulation(s) violated. o The location of the violation. o The violation date and time. o Identification of the Concessionaire’s employee issuing respective Parking Fines. The Key Platform Features & Operating Standards shall not be deemed to be violated by immaterial acts or omissions, including any immaterial failure to comply with specific requirements set forth in the Key Platform Features & Operating Standards other than actions or omissions that endanger the public health or safety. The Concessionaire may change provisions of the Key Platform Features & Operating Standards by providing to the City a request, and explaining the rationale for such change request, for approval of the City, with such approval not to be unreasonably withheld. Any financial or otherwise sensitive information provided by the Concessionaire to the City as part of the Key Platform Features & Operating Standards shall be kept strictly confidential by the City. Subsequent to the execution of this Agreement, The Concessionaire shall prepare and provide the City with a Study for the initial Metered Parking Spaces and the Concessionaire shall provide an additional Study at any time that it wishes to add additional Metered Parking Spaces within the territory of the City during the Term. The City shall provide the Concessionaire with the full support of its own staff and any information arid access as may be requested by the Concessionaire for the purposes of compiling any Study. Each time the City receives a Study from the Concessionaire, it may within ten (10) business days instruct the Concessionaire to modify such Study only to the extent that such Study conflicts in any material way with pre-existing plans or ordinances of the City. In such case the Concessionaire will modify any such Study to reconcile with any such material conflicts identified by the City, and resubmit such modified Study to the City, which will be promptly approved by the City provided that any such material conflicts have been resolved. The Concessionaire may, at its own discretion, establish distinct and multiple geographic Parking Zones within the territory of the City which shall be subject to distinct Metered Parking Fees and Parking Fines provided that the Concessionaire shall demonstrate basis and justification forsuch distinctions within any relevant Study that it shall provide to the City. Such distinctions shall be used for the purpose of ‘ establishing Parking Zone specific Metered ‘Parking Fees and Parking Zone specific Parking Fines for parking violations. The basis of distinction in Metered Parking Fees and Parking Fines among designated Parking Zones shall be either (i) comparative pricing of real estate for purchase or rents’ in respective and distinct Parking Zones; or (ii) based on the utilisation patterns of certain Parking Zones established as high traffic or nocturnal type Parking Zones; or (lin other such basis of distinction similar in nature. Such analyses shall be presented to the City included within any relevant Study undertaken by the Concessionaire. Metered Parking Spaces initially Identified to be part of any particular Parking Zone, may be reclassified to a different Parking Zone, with provision by the Concessionaire of an amended Study which shall be subject to the same process of Study approval by the City as detailed in Article 6 herein. The initial Metered Parking Fee for the Integral/cheapest Parking Zone shall be established as up to $125.00 per fifteen minute interval, with minimum Increments of time, and maximum per session; continuous metered parking time purchases set at the discretion of the Concessionaire, but with adequate notification of the City. The initial Metered Parking Fee described in the foregoing notwithstanding, the Concessionaire shall have the right to convert, at its own discretion, the Metered Parking Fee to a dynamic, demand-based tariffing structure, subject to the Concessionaire’s submission to the City of its precise methodology to be employed in such demand-based tariffing structure for the approval of the City, such approval not to be unreasonably withheld. The initial Garaged Parking Fee for the Garaged Parking Operations shall be established as up to $175.00 per fifteen minutes with possibility of payment In 30 minute increments. The initial Parking Fine for parking violations incurred within the integral/cheapest Parking Zone shall be established as up to $10,000.00 per infraction. The initial Booting Fee shall be established as up to $20,000.00 per instance. The initial Storage Fee shall be established as up to $10,000.00 per 24-hour period. The Metered Parking Fee, the Garaged Parking Fee, the Parking Fine, the Booting Fee, the Towing Fee, and the Storage Fee described in this Article shall be subject to be reset every two (2) years during the Term according to accumulated adjustment for such period of the national consumer price index ‘(“CPI”) or such type of nationally tracked and published index of national inflation. The Concessionaire, may at Its own discretion effect the reset of Parking Meter Fee and Parking Fine levels as well as the levels of the booting fees, towing fees, and storage fees described in this Article with lower frequency and/or with lower magnitude than as set forth within this Article, provided that the Concessionaire shall be permitted to effect any CPI adjustment which is as of yet un-effected, but which is otherwise time permitted or which Is otherwise accumulated according to the terms and conditions herein, at any time during the Term. The Concessionaire, at its own discretion and assessment of public sentiment, may elect to set the initial levels of the Metered Parking Fee, the Garaged Parking Fee, the Parking Fine, the Booting Fee, the Towing Fee, and the Storage Fee lower (but not higher) than the up to $125.00 per fifteen minutes, up to $175.00 per fifteen minutes, up to $10,000.00 per infraction, up to $20,000.00 per instance, up to $30,000.00 ‘per instance, and up to $10,000.00 per 24-hour period respectively, as set forth within this Article. The Concessionaire shall retain the right, at its own discretion, to top up any discount initially applied to the maximum levels, as set forth within this section, of the initial Metered Parking Fee, the initial Garaged Parking Fee, the initial Parking Fine, the initial Booting Fee, the initial Towing Fee, and the initial Storage Fee at any point during the Term, including proforma for any accumulated CPI adjustment thereof which may become applicable during the Term as if the Metered Parking Fee, the Garaged Parking Fee, the Parking Fine, the Booting Fee, the Towing Fee, and the Storage Fee levels had been initially established at their respective maximum levels as set forth within this Article. With respect to motor vehicles parked In Metered Parking Spaces, any motor vehicles .not paying the Metered Parking Fee applicable to the Metered Parking Space In which they are parked at any time shall be subject to be issued a Parking Fine. With respect to motor vehicles parked in spaces where the Concessionaire Is performing Other Enforcement Services, motor vehicles In violation of parking regulations related to such other spaces shall be subject to be issued a Parking Fine. Motor vehicles remaining In violation of Metered Parking Fee or Other Enforcement Services related regulations for more than one (1) hour subsequently to being ‘issued a Parking Fine, shall be subject to being booted or being otherwise immobilized and thus shall become subject to the Booting Fee, which shall be incremental to the applicable Parking Fine. Motor vehicles remaining in violation for more than two (2) hours subsequently to being issued an initial Parking Fine, shall be subject to being towed and thus shall become subject to the Towing Fee, which shall be incremental to the applicable Parking Fine and Booting Fee. Motor vehicles which have been towed according to the process detailed herein shall be subject to the Storage Fee for the time spent in any storage facility of the Concessionaire. Applicable Storage Fees which shall be incremental to the applicable Parking Fine and Booting Fee and Towing fee. In the case when a motor vehicle is left in storage for any period exceeding thirty (30) calendar days, the Concessionaire may direct that such vehicle be sold at public auction as set forth in Section 4.5 of this Agreement. All Parking Fines shall be due to be paid within 30 calendar days of Imposing of such Parking Fines. Parking Fines may be surcharged at a rate of up to 50.0% if not paid within the initial 30-day period, and then an additional up to 10.0% monthly (rounded upward for any portion of any month unpaid) thereafter until paid. The Concessionaire, at its own discretion and assessment of public sentiment, may elect to set the initial levels of such surcharging at levels lower (but not higher) than as detailed in the foregoing. At the discretion of the Concessionaire, a discount of up to 20.0% may be offered to those Parking Fines which are settled within 48 hours of the original issuance of such Parking Fines. Section 10.1. Paid Parking Hours Regular Parking Zones. 7am-7pm Mondays through Saturdays except Holidays. The Concessionaire may, at its own discretion, elect to decrease, but may not increase, the payable hours within the regular zones based on its assessment of public sentiment. Section 10.2. Paid Parking Hours Nocturnal Parking Zones. 7am-pm…Mondays through Saturdays except Holidays. 12am- 3am Tuesdays through Sundays except Holidays. The Concessionaire may elect to decrease but may not increase, the payable hours within the nocturnal Parking Zones based on its assessment of public sentiment. All the Metered Parking Spaces shall free of charge on all holidays nationally observed in Guyana. The City shall have the right to utilize the Metered Parking System only to advertise direct initiatives of the City provided that (ii) such advertising shall be for direct purposes of the City; and (ii) that such advertising shall not consume more than 10% of the total advertising capacity of the Metered Parking System. The City may access the Metered Parking Spaces to perform routine and/or emergency civil works, provided that for any resultant period of non-use of any Metered Parking Spaces which exceeds 7 calendar days per calendar year, a commensurate amount of pro forma revenues for such subject Metered Parking Spaces (calculated as the average daily revenue collection of the respective subject Metered Parking Spaces over the previous 3 month period, multiplied by the respective’ period of nonuse of such subject Metered Parking Spaces) shall be deducted from the Consideration payable to the City. Section 11.2. City Policing & Patrolling Obligations. The City shall provide adequate police presence and regular police patrolling in areas where on-str t parking equipment of the Project is Installed to protect against vandalism and theft, and to respond any alerts and reports of vandalism. The City shall provide adequate police presence and regular police patrolling in areas where employees of the Concessionaire conduct Metered Parking Operations, Including cash collection, and where employees of the Concessionaire conduct Enforcement Activities and Other Enforcement Services. The City shall provide adequate police staffing in the event that the Concessionaire elects to conduct the Enforcement Activities by method of the Concessionaire Enforcement Faculties. The City shall support and facilitate any application or process the Concessionaire may pursue to secure exemption from income, corporation, value added tax), capital gains and all other levies, taxes, duties, cesses or other imposition of similar nature in respect of the importation, use and operation of any equipment and materials, including but not limited to, any unit or part of the Metered Parking system imported by the Concessionaire for purposes of initialisation and ongoing operation of the Project. tornado, flooding, earthquake or other natural disaster, riot or other public disorder, epidemic, quarantine restriction, strike, labor dispute or other labor protest, stop-work order or injunction issued by a Governmental Authority, governmental embargo, except to the extent that the consequence of such event is otherwise specifically dealt with in this Agreement. The Concessionaire may extend the Term for any and each Force Majeure event lasting more than 30 days. Section 14.1. Termination by Mutual Consent. This Agreement may be terminated at any time by mutual written consent of the City and the Concessionaire. Section 14.2. Unilateral Termination by the City. gross investment of the Concessionaire in the Project; multiplied by (ii) the number of years (or fraction thereof) remaining under the Term at the time of the occurrence of such termination, cancellation, rescinding or voiding; plus, without duplication, (iii) the reasonable out-of-pocket and documented costs and expenses incurred by the Concessionaire as a direct result of such termination, cancellation, rescinding or voiding. The City hereby acknowledges and agrees that it may only terminate this Agreement in accordance with the express terms hereof and shall not, In any event, have the right to terminate this Agreement for convenience. 14.3.1. An “Adverse Action” shall occur if the City (or any subdivision or agency of the foregoing) takes any action or actions at any time during the Term (including enacting any law) and the effect of such action or actions, individually or in the aggregate, is reasonably expected (I) to be principally borne by the Concessionaire and (11) to have a material adverse effect on the fair market value of the Concessionaire’s interest in the Project (whether as a result of decreased revenues, increased expenses or both). 14.3.2. The Concessionaire shall have the option to terminate this Agreement, and be entitled to compensation by the City as per the calculation detailed in Section 14.2. herein, for any occurrence of an Adverse Action taken by the City (or any subdivision or agency of the City) at any time during the Term. Section 15.1. Representations and Warranties of the City. The City is a unit of local government, duly organised and existing. (b) Power and Authority. The City has the power and authority to enter into this Agreement and to do all acts and things and execute and deliver all other documents as are required hereunder to be done, observed or performed by it in accordance with the terms hereof provided. (c) Execution and delivery. The City has (I) duly authorised and approved the execution and delivery of this Agreement; and (ii) duly authorised and approved. the performance of its obligations contained in this Agreement. (d) No Conflicts. The execution and delivery of this Agreement by the City, the consummation of the transactions contemplated hereby (including the operation of the Metered Parking System in accordance with the terms of this Agreement) and the performance by the City of the terms, conditions and provisions hereof have not and will not contravene or violate or result in a breach of (with or without the giving of notice or lapse of time, or both) or acceleration of any material obligations of the City under (i) any applicable law or (ii) any agreement, instrument or document to which the City is a party or by which it is bound. Section 15.2. Representations and Warranties of the Concessionaire. (a) Organisation.’ The Concessionaire is duly organised, validly existing and in good standing under the laws of Guyana. (b) Power and Authority. The Concessionaire has the power and authority to enter into this Agreement and to do all acts and things and execute and deliver all other documents as are required hereunder to be done, observed or performed by it in accordance with the terms hereof. (c) Enforceability. This Agreement has been duly authorised, executed and delivered by the Concessionaire and constitutes a valid and legally binding obligation of the Concessionaire, enforceable against it in accordance with the terms hereof, subject only to applicable bankruptcy, insolvency and similar laws affecting the enforceability of the rights of creditors generally and to general principles of equity. (d) No Conflicts. The execution and delivery of this Agreement by the Concessionaire, the consummation of the transactions contemplated hereby and the performance by the Concessionaire of the terms, conditions and provisions hereof has not ‘and will not contravene or violate or result In a material breach of (with or without the giving of notice or lapse of time, or both) or acceleration of any’ material obligations of the Concessionaire under (i) any applicable Law, (11) any material agreement, instrument or document to which the Concessionaire is a party or by which it is bound or (iii) the articles, bylaws or governing documents of the Concessionaire. No investigations made by or on behalf of any Party at any time shall have the effect of waiving, diminishing the scope of or otherwise affecting any representation or warranty made by the other Party in this Agreement or pursuant to this Agreement. No waiver by a Party of any condition, in whole or in part, shall operate as a waiver of any other condition. Section 16.1. Transfers by the Concessionaire. (a) The Concessionaire shall not transfer, or otherwise Permit the transfer of, any or all of its interest to or in favor of any transferee, unless the City has approved such proposed transfer, such approval not to be unreasonably withheld. Section 16.2. Assignment by the City. The City shall have the right to transfer any or all of the City’s interest in this Agreement, provided that it shall be jointly and severally liable with any such transferee for the performance and observance of the obligations and covenants of the City under this Agreement and that any such transfer by the City shall not materially limit or reduce any of the Concessionaire’s other rights, benefits, remedies or privileges under this Agreement. iii. 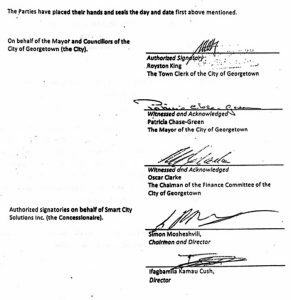 any delay by the Mayor and Councillors of the City of Georgetown in the performance of this Agreement on account of any claim, action, motion, petition, summons, writ or other proceeding whatsoever by the City or any third party whomsoever against the City. If a payment due from the City under this indemnity is subject to tax (whether by way of direct assessment or withholding at its source), the Concessionaire shall be entitled to receive from the City such amounts as shall ensure that the net receipt, after tax, to the Concessionaire in respect of the payment is the same as it would have been were the payment not subject to tax. If any provision or part-provision of this Agreement is deemed to be or becomes invalid, illegal or unenforceable, it shall be deemed modified to the minimum extent necessary to ‘make it valid, legal and enforceable. If such modification is not possible, the relevant provision or part-provision shall be deemed deleted. Any modification to or deletion of a provision or part-provision under this clause shall not affect the validity and enforceability of the rest of this Agreement. Additionally, if any provision or part-provision of this Agreement is deemed to be or becomes Invalid, illegal or unenforceable, the Parties shall negotiate in good faith to amend such provision so that, as amended, it is legal, valid and enforceable, and, to the greatest extent possible, achieves .the intended commercial result of the original provision. This Agreement shall be governed by, and interpreted and enforced in accordance with, the laws in force in the Co-operative Republic of Guyana. The Parties expressly declare that any material disputes arising in connection with the interpretation, performance, breach and termination of this Agreement shall be settled through arbitration. The arbitration shall be administered by the International Centre for Dispute Resolution – ICDR – and in accordance with the applicable rules of the Arbitration Committee of the International Business Council of the United States of America (UNITED STATES COUNCIL FOR INTERNATIONAL BUSINESS) – USCIB -. The place of arbitration will be the INTERNATIONAL CENTRE FOR DISPUTE RESOLUTION (INTERNATIONAL CENTER FOR DISPUTE RESOLUTION) – ICDR – in the city of Miami, State of Florida, USA. This Agreement constitutes the entire agreement between the Parties pertaining to the subject matter hereof and supersedes all prior agreements, negotiations, discussions and understandings, written or oral, between the Parties. There are no representations, warranties, conditions or other agreements, whether direct or collateral, or e*press or implied, that form part of or affect this Agreement, or that induced any Party to enter into this Agreement or on which reliance is placed by any Party, except as specifically set forth in this Agreement. The Parties acknowledge and agree that (i) each has substantial business experience and is fully acquainted with the provisions of this Agreement, (ii) the provisions and language of this Agreement have been fully negotiated and (iii) no provision of this Agreement shall be construed in favor of any Party or against any Party by reason of such provision of this Agreement having been drafted on behalf of one Party rather than the other. This Agreement may be amended, changed or supplemented only by a written agreement signed by the Parties. Section 22:2. Waiver of Rights. Any waiver of, or consent to depart from, the requirements of any provision of this Agreement shall be effective only if it is in writing and signed by the Party giving it, and only in the specific instance and for the specific purpose for which it has been given. No failure on the part of any Party to exercise, and no delay in exercising, any right under this Agreement shall operate as a waiver of such right. No single or partial exercise of any such right shall preclude any other or further exercise of such right or the exercise of any other right. The Parties shall do or cause to be done all such further acts and things as may be reasonably necessary or desirable to give full effect to this Agreement. Without limiting the foregoing, each Party will, at any time and from time to time, execute and deliver or cause to be executed and delivered such further instruments and assurances and take such further actions as may be reasonably requested by the other Party in order to cure any defect In the execution and/or delivery of this Agreement. Except as otherwise provided in this Agreement, each Party shall be responsible for its own costs and expenses incurred in connection with performing and observing its obligations and covenants under this Agreement. Section 22.5. Inurement and Binding Effect. This Agreement shall Inure to the benefit of the Parties and their respective permitted successors and assigns and be binding upon the Parties and their respective successors and assigns. Section 22.6. No Partnership or Third Party Beneficiaries. Except as expressly provided herein to the contrary, nothing contained in this Agreement shall constitute or be deemed to create a partnership, joint venture or principal and agent relationship between the City and the Concessionaire, nor shall any term or provision hereof be construed in any way to grant, convey or create any rights or Interests to any Person not a party to this Agreement. Section 22.8. Counterparts; Facsimile Execution. This Agreement may be executed In any number of counterparts which, taken together, shall constitute one and the same agreement. This Agreement shall be effective when it has been executed by each Party and delivered to both Parties. To evidence the fact that it has executed this Agreement, a Party may send a copy of its executed counterpart to the other Party by facsimile or electronic transmission. Such Party shall be deemed to have executed and delivered this Agreement on the date it is sent by such facsimile or electronic transmission in such event, such Party shall forthwith deliver to the other Party an original counterpart of this Agreement executed by such Party. Each Party agrees to use its reasonable best efforts to notify the other in advance of taking an action or making a change that is likely to have a material effect on this Agreement. The Parties have placed their hands and seals the day and date first above mentioned.